From “Biocultural Practices during the Transition to History at the Vat Komnou Cemetery, Angkor Borei, Cambodia” in this issue. 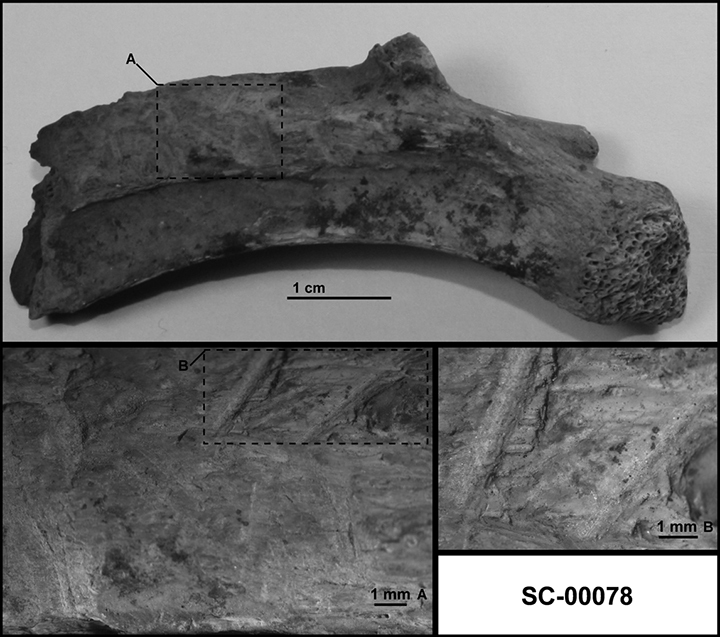 Top image: Probable intentionally stained teeth of Vat Komnou Burial 43B, a 45–55+ year-old male. Photo by Rona Ikehara-Quebral. 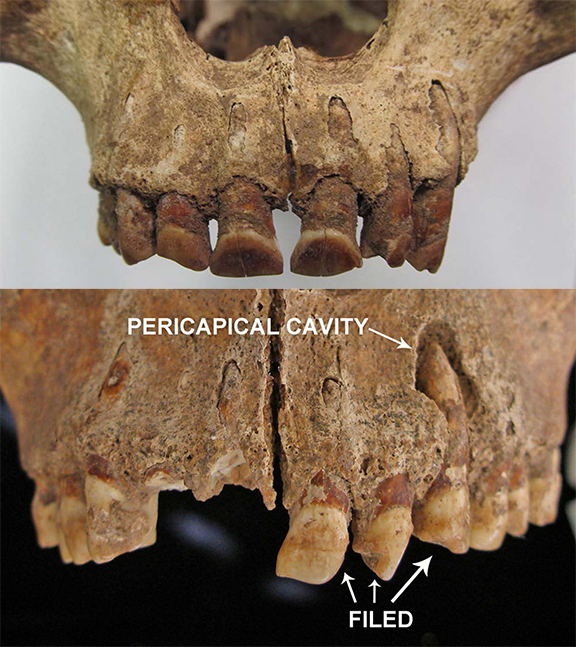 Bottom image: Filed maxillary permanent left incisors and canine of Vat Komnou Burial 36, a 35–45-year-old male. A periapical cavity surrounds the canine root. Photo by Rona Ikehara-Quebral. From “Aleti Tunu Bibi: Contextualizing a New Rock Art Site in East Timor and the Wider Asia-Pacific Region” in this issue. 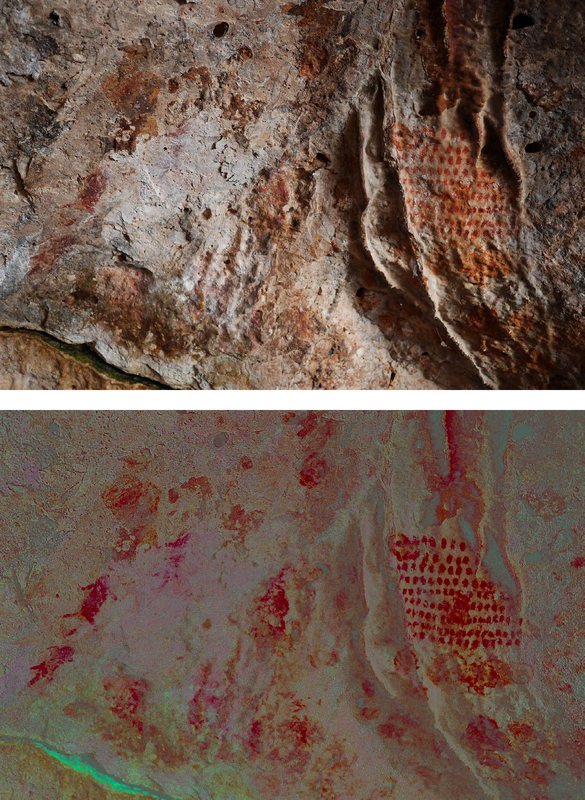 Calcite veil formed in 2015 over rock paintings in Panel 3 (above); enhanced image using DStretch by Jon Harman, V.7.0, April 2010 ( below). Photo by Jean-Christophe Galipaud 2015. The current issue of Asian Perspectives (Volume 55, issue 2) maintains the tradition of keeping readers in touch with new archaeological research findings, approaches, and ideas across the Asia-Pacific region. As always, each work has a geographic focus that refers to substantive datasets from particular places as concrete examples, yet is broadly relevant to research in other regions. Looking into the journal’s future volumes and issues, we invite new manuscripts that emphasize the larger implications of Asian and Pacific archaeological studies beyond geographic boundaries . From Palaeoecology and Forager Subsistence Strategies during the Pleistocene – Holocene Transition: A Reinvestigation of the Zooarchaeological Assemblage from Spirit Cave, Mae Hong Son Province, Thailand in this issue. Cut marks present on a right rib of a Sambar deer ( Rusa unicolor) ( L ayer 2a — S C-00078). Image A taken at 1x magnification on a Nikon SMZ1500 stereomicroscope attached to a SPOT Insight FireWire digital camera; close-up image B taken at 2x. Macro-photograph courtesy of Hannah G. Van Vlack. This reanalysis uses the zooarchaeological assemblage recovered from Spirit Cave to understand hunter-gatherer use and occupation at the site during the Pleistocene – Holocene transition. W e analyze bone fragmentation, sample size, and relative abundance to establish the preservation and overall composition of the remaining fauna. Identification of several new taxa, including roundleaf bats (Hipposideros larvatus and bicolor), elongated tortoise (Indotestudo elongata), black marsh turtle (Siebenrockiella crassicollis), Burmese hare ( Lepus cf. peguensis) and a potential red junglefowl ( Phasianidae — ?Gallus gallus) provide insights into hunter-gatherer occupation, palaeoecology, and subsistence strategies between 12,000 and 7000 years b.p. The “steamship” as mentioned in The Curious Case of the Steamship on the Mekong in this issue. 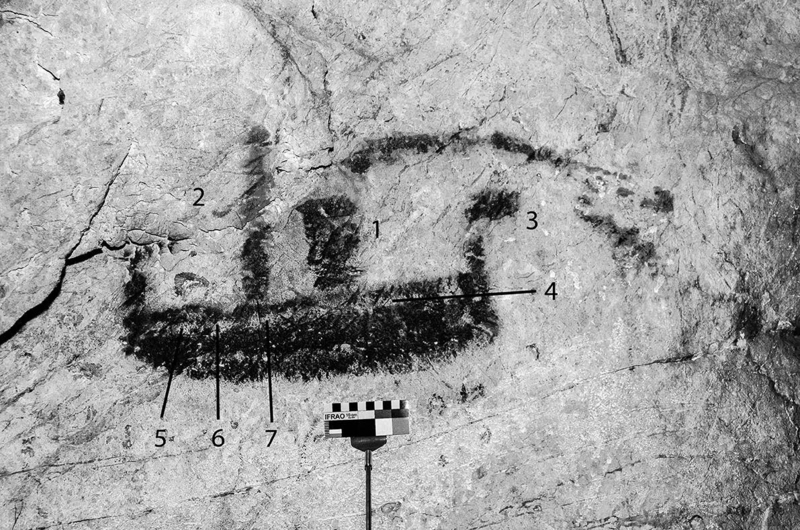 The article speculates that the depiction of the steamship in Tham Phum, a sacred cave with a long religious tradition, might have been painted to memorialize the sinking of La Grandière in 1910 or the Trentinian in 1928.